My love for the water started early were I swam in the Mesa Parks summer leagues at around 8. I then moved on to AAU swimming with the Arizona Desert Rats who then became the Mesa Aquatics Club. At 16 I got my Advanced life saving and at 17 My WSI (water safety instructor). I was a life guard with the Mesa Parks and Rec for several summers and this is were I got my first experience with SCUBA. 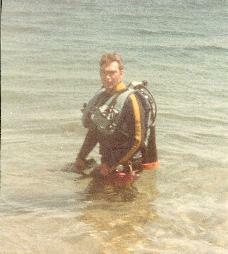 At 17, an older life guard brought a SCUBA kit to work and I tried it in the deep end (Freemont pool). I loved it. We took it to Canyon lake and tried it there. A few years later, it was harder to get air with out a cert so I got my OW cert at El Mar in 1982. 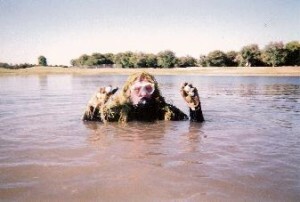 I then went right out and joined the MCSO dive posse with my uncle Robert “Don” Klotz and dove in the lakes and river regularly. All my gear was US Diver. Still have the Conshelf 14 regs. 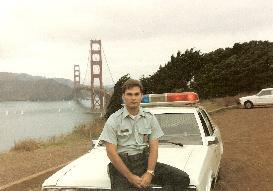 I then joined the US Army as an MP and was stationed at the Presidio of San Francisco. I dove in the San Francisco bay recovering lost crab nets off the Baker/Barry pier to make some extra money. I also moon lighted as a life guard and swim coach at the Marin racquet and swim club. 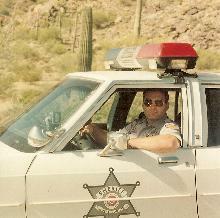 After I got out of the army, I got my degree from ASU and became a Deputy with the Pinal County SO. I was on their dive team through the early to mid 1990’s. Ran into hard times and sold all my equipment. I even lost my log book in all the moves we did at this time. With no one to dive with recreationally in my family, I fell out of diving for several years. I went on to become a firearms instructor and other pursuits. My family has had boats and I became an avid bass fisherman. 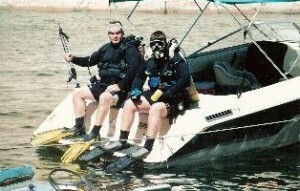 We bought into a house boat on lake Powell and an odd thing happened to bring me back to SCUBA. In the winter of 2002 we were at Canyon lake and my wife was learning to back the trailer. She does a very job at it. The ramp was very mossy and as I was maneuvering the boat to the trailer, our truck started sliding into the lake. Long story short, I tried to get some SCUBA equipment from my uncle to hook up my sunken truck. Ed 4 was intreged by all the talk of SCUBA. My uncle gave Ed 4 his old equipment. We got it serviced, I bought a whole set up for myself and got him his OW as a gift. I was pumped to shar diving with him. Some thing good came out of a sunken truck! We dove that summer at lake Powell and my brother in-law Joey was intrigued. He couldn’t afford to buy certs and equipment for him and his 4 boys, BUT he is extremely inventive. He researched hooka-diving (surface supplied air) and built a fantastic set-up. We could put 3 to 4 divers down on a mid size compressor. we all dived for several hours a day all week for two summers at Powell. In 2005 all 5 of them got OW certed. Two other brother-in-laws soon followed. In 2006 we all started going to the Channel Islands for 2 and 3 day live aboard bug hunts (lobster diving). It is a great feeling that there is now 10 of us diving (one is missing from this pic & 12 counting 2 of their wives) as a direct off-shoot of my love of diving and my sons interest that got me diving again. Ed 4 actually got a job professionally golf ball diving. It was really fun going with him a several times to a course I found that would let us keep non range balls. 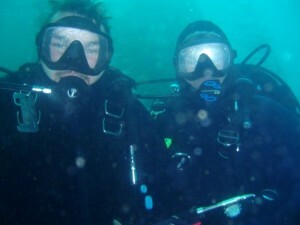 It was really an experience diving for hours in absolute zero vis. I got the urge to get the C-cards to reflect the diving I have done and was currently doing. So along with Ed 4 we punched out Advanced on the diver down at pleasant. We normally dive to 100+ feet on bug hunts, so on one Catalina trip we picked up “Deep”. I always dive with a redundant air source, weight system, etc. Being self sufishant and a having a self rescue fram of mind is just common sense to me. I have passed this on to my family and others as well. So Ed 4 and I got SDI Solo certified. We added Rescue and are working on our Dive Master. I’ll pick up Master Diver in a month along the way. Diving with my son and sharing a passion for diving has given us countless memories. We are able to share ideas, skills and countless hours of conversation and fun. It has brought us even closer together than most father and sons are. We want to share our passion of diving with you.